The Real Estate Cycle – Where Are We Now? | Kearney Realty Co. The Real Estate Cycle – Where Are We Now? Approximately 2500 years ago Heraclitus of Ephesus said “The only thing that is constant is change”. In the moment we sometimes forget that forces larger than we can see are slowly moving culture, markets and people. Everything we see is changing, however the rate of change makes a difference. We notice more readily the melting of an ice cream cone than the erosion of a mountain. It’s normal to only take note of what we can readily see. However, there is wisdom in taking a longer view. Real estate is cyclical. There are many factors involved, but the peaks and valleys of the real estate demand and value have been shown to have a relatively consistent cycle of approximately 18 years. Economist Homer Hoyt made a detailed study of the Chicago real estate market and the broader United States real estate market and found that it has run its course in a steady 18 year rhythm since 1800. There have been exceptions that have disrupted the normal cycle such as The Great Depression, World War II and the post war boom but on average, the business cycle and the real estate cycle have been very consistent including the 18 year cycle than ended in 2008. 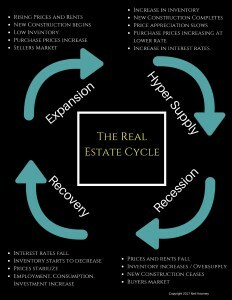 The infographic above shows the four phases of the real estate cycle. Here is more information on each of the stages of the cycle. Most studies present Recovery as the first phase of the cycle, but since the last recession was so memorable I think it makes a good starting point. Think back to what was in the news in 2008 – 2011: Foreclosures, unemployment, short sales, mortgage reform, lowering interest rates, 40% drop in real estate sales, stock market losing value, declining home prices (Boulder was one of the few markets to hold most of its value), consumers reducing spending, rental vacancies, lower rents, incentives to buy and lease, etc. etc. The situation was shocking, many of the US real estate markets had just climbed to all time highs, buyers were using easy credit to buy multiple homes thinking that the easy money would continue indefinitely. And it did, until all of a sudden it crashed. Fortunes were lost. Especially for those who couldn’t hold on for the recovery. This was the low point in the economy and the real estate market. The signs to look for when recession is on the horizon are; interest rates are raised to slow an over heated economy, increased inventory of unsold homes, higher rental vacancies, new construction shows with more unsold inventory and higher interest rates (although some developers who are late to the party always get caught), mortgage delinquencies increase which leads to more foreclosures. During the recession it is a buyers market. Those with the wherewithal should purchase real estate at a discount. We help property owners just like you, buy my house Fort Lauderdale. Best offer guaranteed. This is the bounce off the low point. During this phase the inevitable march of population slowly increases the demand for real estate and other goods. Accumulated inventory gets absorbed, vacant rental units get rented, adult children slowly move out of their parents basements, the Fed lowers interest rates to stimulate demand. With favorable interest rates businesses expand. They hire more employees, make capital investment. During this phase, prices stabilize, excess inventory gets purchased and there is virtually no new construction (developers are licking their wounds), in the aftermath of the recession, banks are very careful about lending. Recovery turns to expansion when most of the available inventory has been absorbed by individuals of businesses. Rental occupancy rates are higher than average, new construction finishes are at a low and stalled projects finish out, built up foreclosure inventory is all but gone. Once the expansion is recognized developers scramble to fill the new demand by planning new projects. However, developing property takes 2-3 years from start to finish so this isn’t instantaneous, there is a lag. With very little new construction the demand for re-sale homes is very strong. This results in rising prices and in some markets the supply demand discrepancy results in multiple offer situations that further exacerbate price increases. In times of unusually low inventory during this phase (before the new construction projects which have been in development are complete) prices tend to reflect an anticipation of where the market is headed rather than the current market price. This is a sellers market. As the expansion phase matures buyers and renters have increased choices but continue to find new places to live. Positive pressure on prices slows. The real estate market falls into a phase of balanced activity. As long as the broad economic forces are stable, this phase can last quite some time. People have jobs, they start families, they buy cars, the buy houses, they buy refrigerators. Companies are making profits, they continue to invest in infrastructure. The delineation between market expansion and hyper supply is marked by an increase in unsold inventory and and increase in rental vacancy. The projects which were started late in the expansion phase continue to come available but to an increasingly tepid response. Growth in prices is decelerating. If developers recognize the turn in the market and stop building, the coming recession can be softened considerably. In this phase, housing, rental units and office space become over built. As interest rates rise we are then led into another recession. First let’s eliminate where we know we are not. We are not in recession, nor are we in recovery. Over the last ten years, the Boulder area real estate market has come through the recession phase and then quickly moved through the recovery phase. I say quickly because we were fortunate not to have a big back log of foreclosure homes that needed to be sold. Since mid 2012 we have been in the expansion phase. Throughout the Denver Metro Area we have seen unprecedented construction of rental apartments. We have seen a steady stream of new residents drawn to our area by a good economy and a great lifestyle. We have seen compounding double-digit real estate appreciation that rivals the top markets in the nation. Early this summer, the temperature of the expansion seemed to have been turned down a few notches and we are now seeing a slowing in price appreciation and a bit less demand. However, our inventory is still very low and the overall economy is still doing well. We seem to be at the beginning of a cycle of increasing interest rates but a 30 year mortgage is still at around 4%. To me it seems like we are still in the expansion phase, but if each phase was a day we would be definitely in the afternoon. Here are the next signs we need to look for which would indicate a shift toward the hyper supply phase: 1) increased vacancy rates on rental properties 2) Meaningful increase in interest rates 3) Increased inventory of resale homes for sale 4) New home builders offering incentives and price reductions.